In contrast to centrally organised states, in the federally constituted Switzerland each canton is completely free to decide its own internal organisation. Therefore, there exists a variety of structures and terminology for the subnational entities between canton and municipality, loosely termed districts. Most cantons are divided into Bezirke (German for districts, singular Bezirk). They are also termed Ämter (Lucerne, singular Amt), Amtsbezirke (Bern, Amtsbezirk), district (in French) or distretto (Ticino and part of Graubünden). The Bezirke generally provide only administration and court organization. However, for historical reasons districts in cantons Graubünden and Schwyz are their own legal entities with jurisdiction over tax and often have their own Landsgemeinde. Seven of the 26 cantons – Uri, Obwalden, Nidwalden, Glarus, Zug, Basel-City and Geneva – have always existed without the district level of government. An eighth one, Appenzell Innerrhoden, uses no intermediate level either, but calls its lowest-level subdivisions Bezirke, although they are functionally equivalent to municipalities elsewhere. 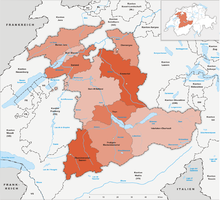 A number of further cantons are considering (or have already decided) an abolition of the district level in the future: Appenzell Ausserrhoden, Schaffhausen, Lucerne, St. Gallen, Schwyz in 2006 voted on its abolition, but voted in favour of keeping the division, some with modifications. Bern in 2006 decided a reduction of its 26 districts to ten administrative regions, which took effect in 2010. St. Gallen, Solothurn and Lucerne removed the administrative role, but retained districts for elections. In 2008 Vaud decided on a reduction from 19 to 10 districts, followed by Thurgau which combined eight into five in 2012. In 2017 Graubünden replaced the 11 districts with 11 regions. In 2018 Neuchâtel eliminated the district level. For further updated about this districts, see: Population size and population composition – Data, indicators: Cantons, communes  or Permanent resident population by age, canton, district and commune 2010–2013. The Canton of Bern is divided in five regions: Berner Jura, Seeland (with two subregions, Biel/Bienne and Seeland), Bern-Mittelland, Oberland (with subregions Thun, Obersimmental-Saanen, Frutigen-Niedersimmental, Interlaken-Oberhasli) and Emmental-Oberaargau (with two subregions, Emmental and Oberaargau) The current division has taken effect on 1 January 2010, based on a 2006 decision to abolish the former system of districts. These were abolished with the new cantonal constitution of 2007, although they will continue to be used as electoral districts. From 2005, Solothurn's ten districts are merged pairwise into five electoral districts, termed Amtei. From 2005, districts only have a statistical meaning. The Canton of Neuchâtel was divided into 6 districts until 1 January 2018 when the district was eliminated. In Appenzell Innerrhoden districts are the lowest administrative division as the canton has no municipalities (except for the Feuerschaugemeinde, a special-purpose municipality for the town of Appenzell). The districts are functionally equivalent to municipalities elsewhere in Switzerland, and are generally shown as municipalities on maps etc. ^ Population size and population composition – Data, indicators: Cantons, communes (Report). Federal Statistical Office. 2014. nden. Retrieved 15 August 2015. ^ Permanent resident population by age, canton, district and commune 2010–2013 (Report). Federal Statistical Office FSO. 2011. nden. Retrieved 15 August 2015. ^ Amtliches Gemeindeverzeichnis der Schweiz, Mutationsmeldungen 2009 / Répertoire officiel des communes de Suisse, Mutations 2009 / Elenco ufficiale dei Comuni della Svizzera, Mutazione 2009 (PDF) (Report). Federal Statistical Office. 2009. nden. Archived from the original (PDF) on 18 November 2010. Retrieved 6 March 2010.